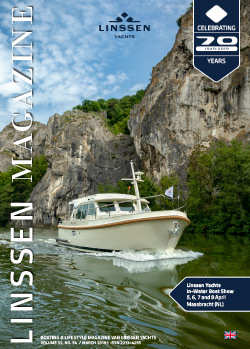 Matti Pitkänen bought his Linssen Grand Sturdy 34.9 AC “TUR 35” via the Linssen dealer Proficon, and decided to collect it from the Dutch yard and sail it home himself. The yacht left Maasbracht on 12 May 2014 and was taken by lorry to Heiligenhafen on the north German coast, where it was launched on 14 May. Next day we stocked up with the necessary stores and the trip could really begin. We left at about noon on 15 May, passing under the Fehmarn Sound Bridge shortly after. There was a gentle north-westerly breeze, which dropped even more, so that the rest of our voyage across the Baltic Sea was under clear blue skies. It was wonderful to watch the porpoises swimming right next to us in the clear water. In the course of a few days, we sailed north along the Danish and Swedish coasts, putting in for the night at Ystad, Karlskrona, Kalmar, Oxelösund, Dalarö, and Sandhamn. From there, we set out for the crossing to our own country. On 22 May – seven days and almost 1000 kilometres after setting out – we arrived at the Finnish island of Kökar, halfway between Sweden and Finland. From there, the next stage was about 235 kilometres to Helsinki. The temperature increased, and when we arrived in the Finnish capital it was a 27° C.
We spent two days in Helsinki for some maintenance work and to have a bit of a rest, and on 27 May we set out on the last stretch of our journey. This took us via the Saimaa Canal, the first section of which is on Russian territory and is leased out to Finland. Our last stop before Russia was at the island of Santio. Here we were inspected by the Finnish border patrol, and all our papers were checked. Next morning, we set off to cross the border and enter the canal. Conditions were exceptionally calm, and the final section at sea presented no problems. Before entering the lock in Russia, we filled up with cheap fuel and we were checked by the Russian border police. All went well and we could quickly continue on our way. On 30 May we arrived late in the evening in Lappeenranta, after “only” 43 kilometres, 8 locks, and an ascent to 76.7 metres above sea level. We also had no problems on the final leg of the journey to our home port at Partakoski.